After a successful run of Outperformers League last year, Mahindra Navistar is back with another series of Outperformers Leagues. This year, the Outperformers League will have eminent speakers from the Indian Trucking, addressing various issues of Indian Trucking and to educate the stakeholders, trying to reach the grass root levels of the Industry. 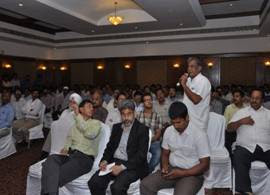 In June, the OPL was conducted in Chennai and Jaipur. Mr. Suresh Kumar spoke on the topic “Tyre Lifecycle Management”, highlighting the importance of choice of tyres, illustrating the construction of tyres between radial and non-radial tyres, re-threading of tyres and the day-to-day parameters to be monitored in-order to maximize the life of tyres. The session very was well received and the Fleet owners have requested his support to build a ready reckoner/checklist for tyre monitoring and maintenance. Mr. Chandramouli spoke on the topic “Business Opportunities and Challenges for Surface Transport” detailing the trends, opportunities, threats to the surface transport segment. During the session, he also covered the impact of the developments in related areas - like large ports and satellite ports, Roads, Information technology etc. on the overall surface transport industry. 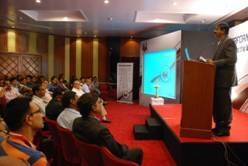 He urged fleet owners to identify the opportunities /threats and address them proactively. Shri R C Gaur, Logistics Head from Shree Cement spoke ex-tempo about present challenges in cement logistics and shared his experiences of over 35 years how the road transportation and its eco system have evolved with modern vehicle fleet coming in and improved roads to ply on. He also brought forward how transporters need to look into costs in more detail and provided examples of what is the cost of driver being idle for a minute, what type of Rs. per km per ton can help running vehicle efficiently in cement vertical and how all parties can benefit. He also provided and invited some transporters to participate in their logistics as they do have shortages of good transports which sparked of many enquiries post the speech. Shri Pardip Varaiya, Head of Training, Indag, the second speaker for the evening, comes from a Tyre background of sales/ service and training. Having the expertise of working for companies like MRF, Apollo and JK Tyres in urban and rural markets in West and North, he had a lot to share. Starting from basics of tyre maintenance, how vital is this component – being second highest expense next to Diesel costs, how good maintenance can provide enhanced vehicle performance namely fuel efficiency/ mileage / longer tyre life thereby improving margins for Transporters. He also showed some cut sections of tyres and wheel imbalance demo with one of the Fleet Owners from audience. The interactive sessions sparked off many a debate. Carrying this forward, Mahindra Navistar’s OPL is sure to address and answer many questions that leave the truckers wondering.